Fiber optics technology can be considered as one of the most important technological breakthroughs ever made. Not only has the discovery of fiber optics allowed us to transfer information at speeds faster than ever before (by breaking through the limits inherent to using metal wiring), it also gave us the ability to transfer that information easily and reliably cross great distances. These feats have helped give rise to modern telecommunications as we know it, enabling us to get in touch with anyone in the world at the touch of a button. More than that, it’s also contributed to the creation of the Internet, something that has made our lives markedly easier and more efficient than at any point in the past. That said, it’s worth asking what the other important applications of fiber optic technology are. After all, the ability to transmit light signals through flexible glass or glass fibers must have other uses as well.Before anything else, however, let’s first examine what optical fibers actually are, how they were discovered, and how they are made today. Optical fibers: what are they? So what are optical fibers? Optical fibers refer to the super-thin strands of purified glass or plastic that are fabricated in order to transmit data from one location to another, with the data transported in the form of pulsed light. This is similar to how copper wiring transmits information as pulses of electricity, except in this case the light doesn’t have to constantly fight against the resistance of the wire like electricity would. Rather, it simply travels the length of the optical fiber and guided along its intended path. Thanks to the complete lack of resistance, this data transfer process takes places much faster than if copper wiring were involved. To put it into stark contrast, a single fiber optic strand can carry as many as 20 billion pulses of light in a single second. Meanwhile, copper wiring can only transmit only one or two million electrical pulses per second. But wouldn’t the light just pass through the cable and continue on a straight line, especially since the optical fiber strand is made out of pure glass? The answer is no, and it’s all thanks to the phenomenon known as total internal reflection. This means that as long as the light is transmitted through the strand, it will simply bounce off the ‘inner walls’ of the optical fiber at an angled trajectory, and keep bouncing until it reaches its destination. How was the principle of fiber optic technology discovered? The very concept of how fiber optics work, i.e. guiding light through refraction, was discovered by the Swiss physicist Daniel Colladon during the early 1840s. It was also by complete accident. Colladon, then trying to show to an audience the sight of a water jet at work, attempted to do so by using a glass tube to collect sunlight and to pipe it to the lecture table. The light, trapped into the tube thanks to the phenomenon of total internal reflection, was then transmitted to the very stream of the water jet once they aligned. The light then continued to flow through the new ‘pipe’ created by the water jet’s stream, following its curved downward trajectory rather than continuing to follow a straight path as was originally expected. It was at that moment that Colladon realized that light could be guided in completely different directions as opposed to just being a straight beam. This discovery would go on to be the working principle of fiber optic technology. Without getting too technical, here is a very brief rundown of how optical fibers are made. First, the preform needs to be made. A preform is essentially a cylinder of purified glass, where the optical fiber strands will be “pulled” from. It’s made through a chemical process known as Modified Chemical Vapor Deposition, or MCVD. This process involves oxygen being bubbled through certain chemical solutions, such as silicon chloride and germanium chloride. This creates a gas which is then piped into a hollow tube made out of pure synthetic silica. Heat is applied through all sides of the tube via a super-hot torch, forcing the gas to react and form silicon dioxide and germanium dioxide inside the hollow tube. The application of heat continues until both substances fuse together, resulting in glass of extremely high purity. The preform is then installed on a vertical setup, where it’s slowly melted on one end by being lowered into a super-hot furnace. This melting process results in a molten blob of glass forming and then being drawn downward by gravity. As the blob drops down the vertical setup, it leaves behind a thin strand of glass that quickly cools and solidifies. It’s this strand that becomes the very optical finer itself. Fiber optic assembly machines with linear bearings, or very precise ‘tractor’ devices, continue to “pull” the strand of glass from the slowly melting preform. Absolute precision that only motion solutions can provide is critical here, as any minor deviation in the direction of the pulling motion could easily result in a deformation, kink, or even break in the still-cooling strand of glass, which can easily compromise the quality and integrity of the fiber optic strand. With the entire preform drawn into a thread, the finished strand of optical fiber is wound up into a spool, ready for testing, packaging, and then use. What are the important applications of fiber optic technology? Now that we know all about optical fibers and the principles of fiber optics technology, here are some of its important applications. Telecommunications. As noted earlier, fiber optics technology is key to fast, efficient, and reliable telecommunications all over the world. The speed with which light signals can travel from one end of an optical fiber cable to another, regardless of length, allows for near-instantaneous transfer of information no matter how great the distance. Such is the basis for modern technological marvels like the global telephone network, cable television, and the Internet itself. Military applications. As fiber optic systems deal with light and not electricity, which makes them immune to magnetic disruption sand wiretapping—and thereby, inherently more secure. This makes fiber optic technology a perfect choice for military applications, where the integrity, efficiency, and quality of the data being transmitted is paramount. As such, we can see fiber optics being implemented in military communication gear, as well as in the communication systems of their land, sea, and air vehicles. Weapons have been known to also sport fiber optics to improve visibility of the markings on their aiming sights. Industrial applications. Fiber optic systems are also used in industrial applications, such as to examine areas that are usually too unsafe or impractical for human personnel to stay in at any length of time. Fiber optic sensors, for example, can be used to safely measure the temperature inside of jet engines as the jet itself is in operation. These sensors can also be used to measure the strain, temperature, and pressure inside unhospitable environments. Medical applications. Fiber optics is also used in the medical industry to provide visual imaging inside the human body without having to resort to invasive surgery. One popular example of this is the endoscope, a diagnostic instrument that resembles a long and flexible thin tube with a lens or camera at the very end. The tube itself is made from bundled optical fibers. The inherent flexibility and thin nature of the optical fibers allow for the endoscope to easily be inserted into tiny incisions or orifices, allowing doctors to observe the human body from within without having to cut their way inside. This is essential for diagnosing conditions that may prove difficult to see from the outside, such as certain cancers and internal diseases. Spectroscopy applications. 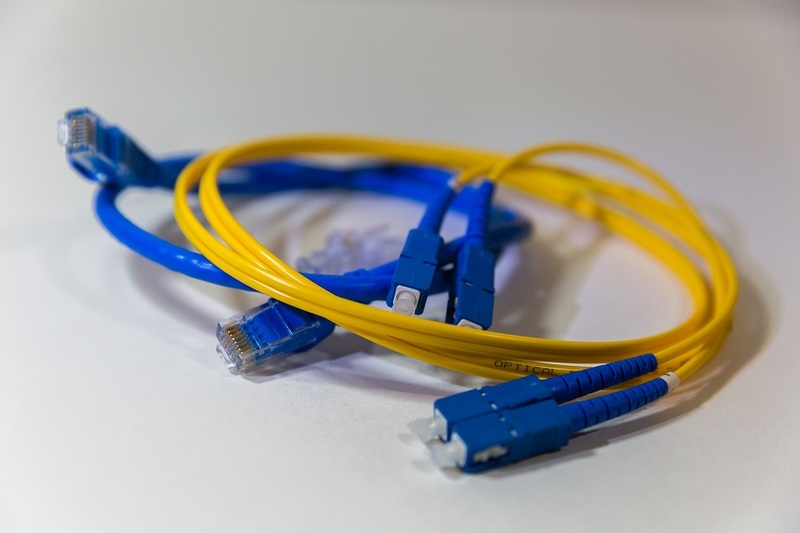 Optical fiber cables can be used to facilitate remote spectroscopy, wherein the nature and composition of substances are measured or deciphered by bouncing light off and through them. Through the use of optical fibers, a spectrometer’s analyzing light can be ‘beamed’ to an object too big to actually fit inside the instrument itself. Such a process can also be used to measure gases or far-off objects. Power transmission applications. Optical fiber is also utilized to convert light into electricity by way of a photo voltaic cells, or more commonly known as solar cells. While this particular type of power transmission is not as efficient as conventional ones, it can be used in situations where metallic wiring may prove to be undesirable, such as with MRI machines and other equipment sensitive to magnetic forces. Due to its many applications and practical uses, we can easily say that fiber optic technology remains as one of the most significant technological breakthroughs ever made. From revolutionizing telecommunications to facilitating the creation and proliferation of the Internet, Daniel Colladon’s discovery has certainly contributed quite a bit to the advancement of mankind. Only time will tell if other applications of fiber optic technology will be discovered in the future, and if they will also have as dramatic an impact as the applications we enjoy today.